Time does not flow like a river towards the sea in L'Engle's cosmos. Many Waters takes place somewhere in between A Wind in a Door and A Swiftly Tilting Planet--and some 3,000 years in the past. The story of Noah getting a fictional treatment gives me some mixed feelings. 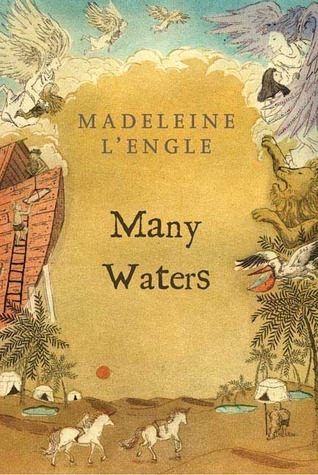 I love that L'Engle's books have spiritual and quantum physics mixture, but taking a biblical story and making it her whole plot is a stretch for me. Yet despite my misgivings, I couldn't put the book down. L'Engle's writing is enthralling and thought provoking. I may not have loved the subject, but the lesson was one of her best. The adventures of Sandy and Dennys start in the lab when they accidentally tamper with an experiment. They find themselves in a desert with no way to return home. Unicorns make a second appearance. These aren't your standard fairy tale unicorns. These are quantum unicorns that travel through space-time. We are also introduced to water divining mammoths, seraphim, and nephilim. The regular people are interesting characters too. The way that everyone interacts with each other and the lessons they all take away from each other are what make this story. It is full of tension and excellent pacing. I just wish it hadn't been Noah.